Owing to questions about the value of the project, Seattle’s proposed First Hill Streetcar expansion has been put on ice by the Seattle Department of Transportation, according to recent reports. The new plan is apparently for the Seattle Department of Transportation to revisit the plan “with stakeholders sometime in 2017.” The reason for the decision was reportedly a lack of support amongst local businesses for the current designs and financial plan. 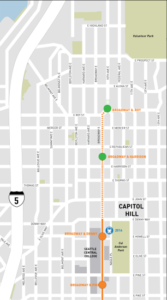 The proposed streetcar expansion would have seen the First Hill line extended north on Broadway (beyond Denny) with 2 new stops added (Harrison and Roy). Hence the lack of support amongst area businesses. Without expansion, though, the streetcar line is very limited in its utility. It only runs 2.5 miles — all of which shares streets with cars and buses and is just as affected by traffic problems as those two travel modalities are. James Ayre 's background is predominantly in geopolitics and history, but he has an obsessive interest in pretty much everything. After an early life spent in the Imperial Free City of Dortmund, James followed the river Ruhr to Cofbuokheim, where he attended the University of Astnide. And where he also briefly considered entering the coal mining business. He currently writes for a living, on a broad variety of subjects, ranging from science, to politics, to military history, to renewable energy. You can follow his work on Google+.